Good Stuff #1: Election Results! The winning candidates are the District 2 incumbent, Regina Holley, a former Pittsburgh principal and strong advocate for our students and schools. I have great respect for Dr. Holley and it has been an honor working with and getting to know her these past few years. In the hotly contested District 4 race, Lynda Wrenn won in a landslide victory, demonstrating the power of grassroots coalition building, with parents, teachers, and community members providing an army of “boots on the ground” to get out the word. Ms. Wrenn is the mother of two PPS graduates and two current students, has served as a PTO president, worked with the district on numerous task forces, has a master’s in teaching from Chatham, and is deeply involved in the community. In District 6 the city gains a new champion for education justice with Moira Kaleida, a community leader who is active with Great Public Schools (GPS) Pittsburgh and mother of two young children just starting in the public schools. District 8 also endorsed a candidate running on a strong equity platform: Kevin Carter, the founder and CEO of the Adonai Center for Black Males, a nonprofit that helps young men transition from high school to college or trade school, and from higher education to the workplace. In debates this spring and in public statements and personal conversations, I’ve been very impressed with both Ms. Kaleida’s and Mr. Carter’s understanding of the issues facing public education. These four candidates will join four other school board members elected in 2013 who were also backed by the education justice movement. That makes Pittsburgh’s board a rarity among large U.S. cities: democratically elected and supportive of evidence-backed policies to make all our schools the places all of our children deserve. A final note about the elections: congratulations to our colleague Helen Gym, who won a huge primary victory for Philadelphia City Council running on a public education platform! This is absolutely amazing news for Philly and for all of us in Pennsylvania. Good Stuff #2: Testing Resistance! Mary King made big waves here and nationally when she refused to give high-stakes-tests to her students this spring. [Post-Gazette, 5-23-15] Ms. King teaches English language learners at Pittsburgh Colfax and decided that she had to take a stand as a conscientious objector after witnessing the harm done to her students. [See our “Brave Teachers Speak Out About Testing”] The Post-Gazette article about her was the #1 most shared story in last Saturday’s paper, and was also hilariously featured in Gary Rotstein’s Morning File on Monday. [Post-Gazette, 5-25-15] Diane Ravitch even named Mary King to her national honor roll! “Indeed, Mary King’s action in refusing to administer the state tests to her ESL students is unique, courageous and pioneering. However, far from standing alone, she is part of a growing movement of parents, teachers and students who are standing up against the egregious testing mania which is part of the current attacks on public schools. As a middle-school teacher in the Pittsburgh Public Schools, it is my experience that it would be hard to find a teacher who does not have similar stories about how the testing frenzy has hurt individual students, let alone how it has been a central part of the destruction of real teaching and learning in our schools. Indeed, the movement against the overuse and misuse of high-stakes-testing is growing exponentially here in Southwest Pennsylvania. As one simple measure of interest in this issue, my piece last month on “The Religious Reasons My Kids Won’t Be Taking the Test” has become our second most read post of all time; was shared by readers from this blog over 2,000 times; reached over 26,000 people from our Facebook page; and was re-published by the Washington Post and AlterNet.org. Good Stuff #3: Listen to Teachers! Not a mention in here of testing students more, or more “rigor,” or “standards,” or “firing bad teachers.” Nope. Listen to their recommendations about what actually works for students: “If these teachers could choose where to focus education funding in order to have the highest impact on student learning, their top priorities would be: Anti-poverty initiatives, early learning, reducing barriers to learning (access to wrap-around services, healthcare, etc. ), and professional development/learning.” [Scholastic 2015 Survey] Sounds like our education justice platform, no? Good Stuff #4: Governor Wolf! Oh, this Governor. He wants to put more money into the public education budget! He’s going around the state lobbying for early childhood education rather than more prisons. [Post-Gazette, 5-26-15] He even sent a sharply worded letter to the Pennsylvania Chamber of Business and Industry, which opposes restoring the budget cuts to public schools, accusing business leaders of putting “oil and gas special interests” before the interests of our children. [Post-Gazette, 5-19-15] What is he thinking? Happily, he is doing exactly what we asked him to do when we elected him with a clear mandate to support public education. We still have plenty of work to do with legislators who do not think schools and kids should come first. But what a refreshing change of leadership from the very top. And we did this! Good Stuff #5: Lobbying to End School Push-Out! 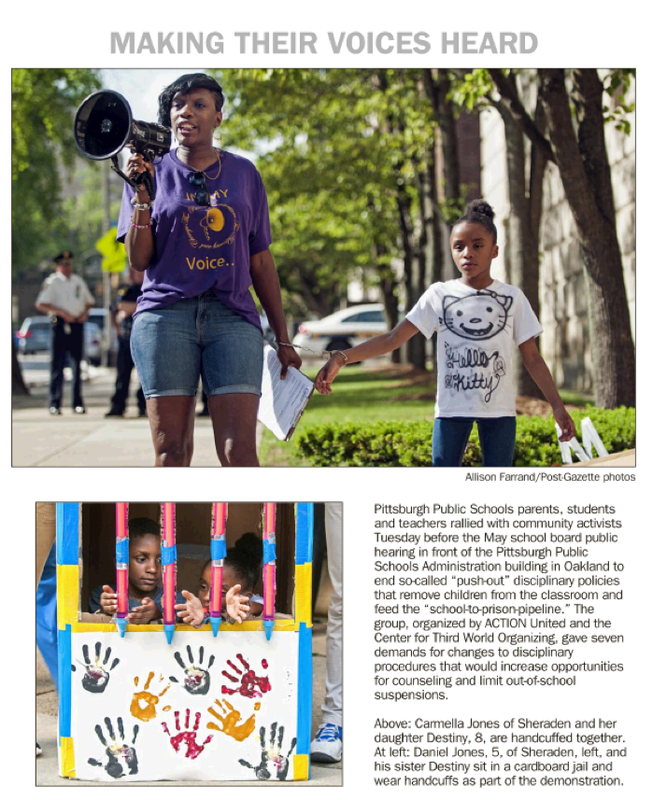 On Tuesday, our coalition Great Public Schools Pittsburgh held a rally before the school board meeting to highlight school push-out. Students of color and students with special education needs are disproportionately impacted by school suspensions and other practices that push kids out of school and, too often, into the prison pipeline. For example, last year African-American students, who comprise 54% of the Pittsburgh student body, received over three-quarters (77%) of the district’s suspensions. Adopt support-­based, district-wide disciplinary policies that move away from exclusionary discipline practices in favor of a comprehensive restorative justice approach. Revise the Student Code of Conduct to divide the levels of infractions for misbehavior into five (5) levels. Out­-of-­school suspensions are not an option for the first two levels and expulsion is only an option for the fifth level. Remove option of permanent expulsion. Further revise the Student Code of Conduct to include a glossary/index that defines every misconduct offense, guidance approach and possible disciplinary responses in student/caregiver friendly language. The Student Code of Conduct must be translated for non­-English speaking families. Place a moratorium on out-­of-­school suspensions/expulsions for our youngest students, preK­5th grade, with nonviolent misconduct. Assign, in every school, at least one full­time counselor or social worker whose primary job is to coordinate appropriate interventions and support for students. Provide PPS police officers and security with the proper and necessary training on topics to meet the varying needs of officers working with youth. Publicly report suspension and expulsion data at monthly School Board Legislative meetings broken down by grade, race, and disability category. Pam Harbin addresses the rally before the school board meeting. PA Representative Ed Gainey supports the work. New school board nominee winner Moira Kaleida, who has been working with GPS on this issue, speaks to the crowd. Good Stuff #6: More Equity Work! I am delighted to announce that starting Monday, I have a new job. I will be the inaugural Director of the new Women’s Institute at Chatham University. I also have a faculty appointment and will continue teaching. I will be leading efforts to focus on gender equity through education, research, and outreach – both on campus and in the larger community. I am thrilled that Chatham is continuing its commitment to gender equity and women’s leadership and am excited to be a part of this crucial work. I don’t know how much time I will have for blogging as I settle into the new position, but will certainly remain engaged in our education justice movement. As feminism has taught us, systems of power and oppression overlap; our fight for justice and equity in public education is intimately connected to the fight against racism, poverty, homophobia, sexism, and gender discrimination. I can’t wait to get to work! So I applaud those who take a stand and help the rest of us see what is going on, as two more Pittsburgh teachers did this week. Mary King has a beautiful op-ed in the Post-Gazette today explaining why she is a conscientious objector and will not administer the PSSAs to her students this year. She may be the first teacher in Pennsylvania to do so and her action recalls a long Quaker and pacifist tradition in this state. Earlier this week, Kipp Dawson testified to the Pittsburgh school board about the way in which testing is hurting her students. I encourage you to read their moving words, below. And then maybe we should stop and question a high-stakes testing regime that requires our teachers to become conscientious objectors or risk their own livelihoods, just to do what is best for their students. Thank you, brave teachers. I am an English as a second language teacher in grades four to eight at Pittsburgh Colfax K-8. The other day one of my ESL students passed me a note with a shy smile as he left our classroom: “Learn English is the best thinks a never have in my life.” My heart melted. This student arrived just last spring with absolutely no English. He is finally starting to speak above a whisper. But this student is being crushed, intellectually and emotionally. Despite the fact that he is still so new to English, he is in the midst of his scheduled 16 hours of PSSA testing; my other ESL students are scheduled for between seven and 20 hours. It is my professional opinion that this experience will set my student back, that it will hurt his progress, but my professional opinion will never be weighed against the many requirements — federal, state and district-wide —which demand that these tests be given. A girl who returned to her native country in March talked about knowing only a few greetings in English but having to take the PSSA math test during her first week here and how she remembers crying throughout the week. I remember, too. I also remember the student who had no formal schooling before she became an eighth-grader at Colfax who wrote “I love ESL” repeatedly on her math test to save face with the other students working around her because she was not even able to understand the questions. It is with these students in mind, and many others, that I have asked the principal of my school to re-assign me during PSSA testing. I can no longer, in good conscience, administer the PSSA. I am ready to become a defender of my students — a conscientious objector. But things have changed. It is no longer the same as when you and I were in school. Most of us had only two mornings of testing, perhaps, in math and reading. Most Pittsburgh Public Schools sixth-graders are required to take 22 standardized tests this year. You might be thinking, “As a teacher you can use the results of these tests to help the students improve.” But I cannot. The tests are developmentally inappropriate for my students, written far above their grade level. Worse, neither the students’ families nor their teachers will receive the students’ PSSA test scores until long after the school year has ended. Even then, the individual results, the questions that the students got wrong, will never be known, remaining a mystery for-ever to all except the testing company. I am a strong advocate for my students within the ESL department and with my colleagues at Colfax. My students need to feel safe and cared about in order to cope with the challenges they face learning a new language and adjusting to a new culture. So this act of conscience is an extension of my advocacy for my students. It might not affect their experience this year, or change any state or district policies, but, for me, it is the right thing to do. These tests are not helping. They are hurting many of my students. I can no longer, in good conscience, administer the PSSA tests to my students. Mary King has been teaching for nearly 26 years, all but four of them in Pittsburgh Public Schools. In addition to teaching ESL, she has been a school librarian, language arts teacher and school psychologist. She lives in Squirrel Hill. 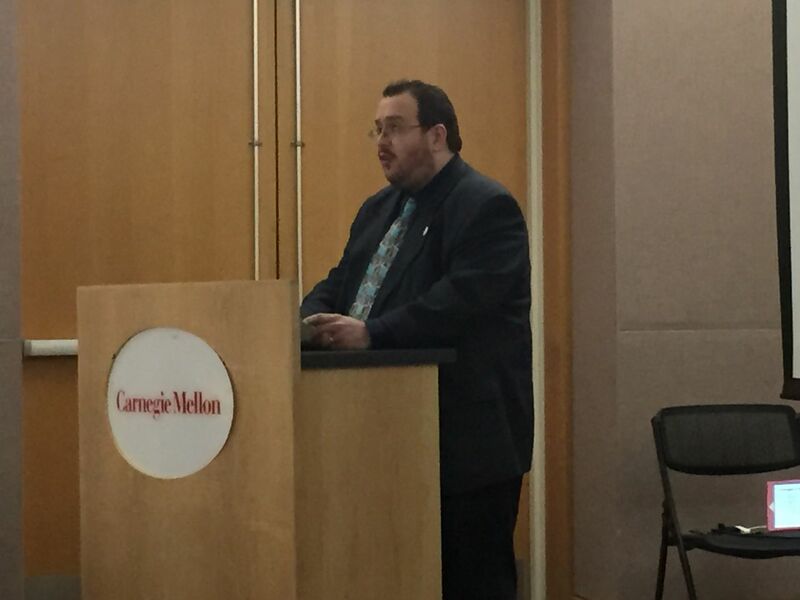 Last night a member of the Pittsburgh Board of Education thanked me, and other colleagues, for testifying at their public hearing about the realities of the testing tyranny. He said that he’s been raising these issues for a long time, but it means so much more when teachers, who experience these things, speak out. Not all of us feel we can take these steps, but for those of us who can, we should know that our voices mean even more than we might think. He was responding to my comments which implored Pittsburgh school leaders to join their colleagues who are speaking out. Here is part of the story I told: Until last Tuesday, I would have introduced myself also as a Pittsburgh Public School middle-school teacher. On Tuesday, for nearly half of the day, my title changed to Test Administrator, as did that of almost all of my colleagues in our schools. In that capacity, my role, and that of my colleagues, practically reversed itself. Instead of being the nurturing adults who work to inspire thoughtful and thought-provoking conversation, inquiry, focused reading, and spirited interchanges of ideas and information which spur curiosity and real intellectual growth, we now are enforcers. Of rules we did not participate in creating. Of an atmosphere which is antithetical to the teaching/learning communities we have worked, with our children, to create. What does this do to our children? I invite you to take with you this image, which I cannot get out of my head, and which is one that compels me to stand before you today. Two years ago I was teaching a class of middle-school students who were significantly below grade level in reading. Among them was an eighth-grade young-woman-in-development whom I had taught other subjects for the two previous years. That year I had watched her develop from a child who hid behind books and papers, or with her head on desks and tables, into a student who was becoming confident enough to try those academic challenges which she’d assumed would always be beyond her. She was reading aloud with her peers, participating in discussions and written responses to her reading, and, especially, joyfully finding her voice as a writer. She was approaching the coming of high school with a growing confidence, and almost with joy. Then, one day, she took one of those standardized tests. One that would give her immediate feedback. I watched her at the computer. In slow motion it all comes back to me. Daily. She stood up, stumbled to her desk, crawled under it, banged her head on the floor over and over again, crying, “I’m so stupid. I’m so stupid. I’m so stupid . . .” The numbers that came up on the screen had become her self-image. And they were wrong. As we head into several weeks of high-stakes-testing here in Pennsylvania, I would like to share with you the religious reasons my children will not be taking the state mandated PSSAs. Here is an open letter I sent to Dr. Linda Lane, Superintendent of Pittsburgh Public Schools; Dr. Lisa Augustin, Director of Assessment; Ms. Jamie Kinzel-Nath, Pittsburgh Colfax K-8 principal; and all of our children’s wonderful teachers. Pursuant to Pennsylvania Code Title 22 Chapter 4, section 4.4 (d)(5) I am hereby exercising my right as a parent to have my children, ____________, excused from PSSA testing on the grounds of my religious beliefs. Please allow ­­­­­­­­­___________ to pursue alternate educational activities such as a research project or volunteering in younger classrooms during testing. I could stop my letter right there, as that is all that is legally required by the state in order to excuse our children from testing. However, as this is our third year writing such letters, I would like to explain the religious grounds we have for refusing to allow our children to be tested. Even though, under law, no state or school official is permitted to ask us about our faith nor require “proof” of our beliefs, I would like to share these religious reasons with you. We belong to First Unitarian Church of Pittsburgh, a member of the Pennsylvania Interfaith Impact Network (PIIN), which is active in education justice. Every Sunday, we recite seven principles that unite Unitarian Universalists. Most of these principles are basic moral and philosophical statements shared by all of the world’s major religions. They reflect the common values of most faiths, from “love one another” and “do unto others,” to respect for the spark of the divine in each of us, and the ethical-humanist imperative to leave this world a better place. Please allow me to explain how each of these seven principles has led us to refuse high-stakes-testing for our own children, and on behalf of all children. Every child is valuable – priceless – and has the human right to a rich, full education. Respecting the inherent worth of every child also means treating each student as an individual, and not a widget being produced in a factory. Standardized testing, tied to an ever more standardized common core curriculum, sorts students into categories (“below basic,” “basic,” etc.) There are serious consequences to this sorting and labeling (see below), but the underlying premise of this standardized high-stakes-testing is to compare and rank students – not to support the individual learning of each student. This is clearly evident when schools use standardized, normed tests, which force all students into a bell curve, guaranteeing that a large proportion of the children will fail. To get that nice bell shape of test results, with exactly half of the children falling on the “below average” side of the curve, the tests are carefully designed with purposefully misleading questions. For instance, test makers will use tricky sound-alike answers to intentionally trip up English language learners, or culturally specific clues most easily decoded only by students from wealthy families. Pittsburgh is subjecting students to the normed GRADE test not once, but three times a year (a result of accepting state money that came with testing strings attached). Teachers have been reporting the problematic GRADE test questions for years, but the test-maker has not changed them because this “assessment” requires a set failure rate. In what way does this kind of standardized testing respect the inherent worth of our students? When students’ test scores are then displayed for all to see on “data walls” (an increasingly common practice in our schools), how does this respect the dignity of each child? While advocates claim that high-stakes-testing will hold teachers and schools accountable for student learning and therefore promote equity, it often does the exact opposite by reinforcing inequality. High-stakes-testing labels our schools as “failures,” but never results in additional resources to actually help kids. Instead, “failing” schools are often targeted for closure. When you look at the pattern of school closures across the country – including here in Pittsburgh – you can see that districts have closed schools in predominantly black and brown neighborhoods, displacing some students multiple times. Our communities of color have been harmed the most, with places like Oakland and Hazelwood turned into education deserts without a single neighborhood public school. Schools labeled as “failing” on the basis of student test scores are often targeted with other “reforms” that rarely help children. Our own beloved Colfax provides an excellent example of the “disruptive innovation” imposed on supposedly failing schools. Nine years ago when our family first started at Colfax, its large achievement gap had recently earned it a designation as a “turnaround school.” The district fired every single teacher and the principal then handpicked an entirely new teaching staff. The idea, of course, was that we had to get rid of the “bad” teachers and hire only “great” teachers and that would solve the problem of low test scores. Fast forward almost a decade and you can see that this didn’t work: Colfax still has one of the largest achievement gaps in the city (which is really an opportunity gap made highly visible by the presence of families from some of Pittsburgh’s wealthiest and poorest communities together in the same school). During this same decade, Colfax students also experienced a relentless series of “reforms,” all aimed at increasing test scores. When we started, Colfax was a Spanish language immersion school, then we lost the extra language instruction to become an “Accelerated Learning Academy” focused on reading and math. We got an America’s Choice curriculum that was supposed to solve everything and added extra periods of reading. We got a longer school day and a longer school year. We got a Parent Engagement Specialist. Then we lost the curriculum, lost the extra time and days, and lost the parent specialist. The district changed to a 6 day week, so we could cram in extra reading and math periods, since these are tested subjects, resulting in a net loss of music, art, language, and physical education. With state budget cuts we lost more music and athletic programs, and we even lost our after school tutoring program aimed at those very students whose test scores continue to cause so much alarm. And class sizes ballooned to 30, sometimes 35 and more students. Mr. Parker also examined the ways in which high-stakes-tests are used to exclude students from high-quality courses and programs. He gave the example of a young woman of color in his class right now with a 4.0 GPA – “one of the most well-rounded and motivated students I’ve ever had” – who will be excluded from taking the advanced math and science courses she would like to take next year solely because of a test score. So if our students who need the most help never get that help, where is the equity? If a young woman of color with 4.0 GPA wants to take advanced math and science classes but and can’t because of a single test score, where is the justice? If children now label themselves with their own test scores and literally believe themselves to be “below basic,” where is our compassion? Part of accepting one another is recognizing that we each have unique gifts and strengths. We are not all the same. Some students excel in trombone or slam poetry, or are highly empathetic or fantastic story tellers: none of which gets measured by high stakes testing. I am concerned about the intellectual growth of our students as well as the nurturing of their individual spirits. I believe in real learning and more learning time for our children. I support quality assessments that help our children learn and provide meaningful information to teachers to help them meet the needs of individual students. I want tests, ideally designed by teachers, which align with the curriculum and give timely, informative results to parents and students. Lost learning time: there’s less time for learning with testing and test prep (for instance, Pittsburgh students now take 20-25, or more, high-stakes tests a year). 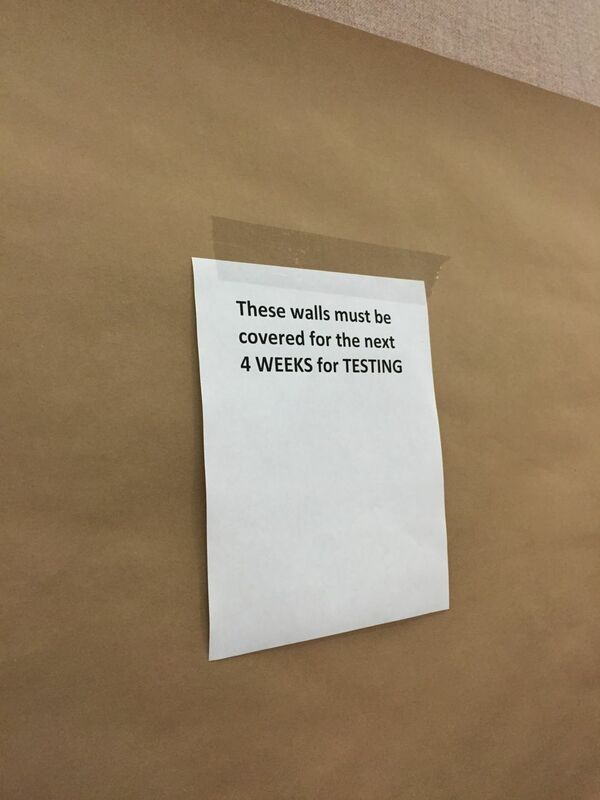 We have reports in the district this week of students covering up the walls to prepare for testing, rather than spending their time learning. Narrowed curriculum: with a focus on reading and math scores, students lose history, civics, world languages, the arts, and other programs. Decreased ability to write: writing portions of high-stakes standardized tests are graded by hourly employees – not teachers – who are often recruited from Craig’s list and paid minimum wage. To “pass” these tests, students are taught a narrowly confined way to answer writing prompts. Subjected to stale, dull methods: educators report that the focus on high-stakes-testing and test-prep means they cannot be creative and innovative in their teaching. Missed teachers and classes: intense security measures prevent teachers from overseeing testing in their own classrooms, so teachers from non-testing classrooms (such as Kindergarten teachers) are frequently pulled from their students to proctor exams. Used as guinea pigs: schools and districts routinely agree to allow their students to “field test” new questions and entire exams for testing corporations without notifying parents or compensating students. Teachers are expected to give a test they did not design, on material they did not teach, to students who will not learn anything from the experience. Those teachers, students, and their parents will never see the results. Last year when the district field-tested text dependent analysis, one principal told us students ripped up the tests and said they couldn’t do it. Field testing further reduces actual learning time and contributes to the stress imposed on our children. Shut out of programs: high stakes exclude students when test results count as extra weight in magnet lotteries or for entrance to gifted programs or advanced courses. Diverted resources: the hundreds of millions of dollars spent on testing in Pennsylvania are not available for classroom education. Most high-stakes tests are written by and benefit the bottom line of a handful of large international corporations. For instance, the new School Performance Profile system, largely based on student test scores, cost Pennsylvania taxpayers $2.7 million to develop and it will cost an estimated $838,000 every year to maintain. This does not include the five-year, $201.1 million contract with Data Recognition Corporation to administer high-stakes-tests to our students. Dr. Greg Taranto, Pennsylvania Middle School Teacher of the Year and member of Gov. Wolf’s education transition team, recently shared with us that state testing will cost us $58 million this year! School closures: schools labeled as “failing” on the basis of test scores can be threatened with closure. These schools are usually in communities of color. Loss of curiosity and love of learning: bubble tests are developmentally inappropriate for the youngest learners, yet are routinely being pushed down into Kindergarten in an attempt to get students “test ready.” The emphasis on “skill drill and kill” fails to stimulate children’s imagination and limits their natural curiosity. At Colfax, I’m concerned this has meant that our “enrichment” period has turned into an extra period of reading skills for most students. Blocked access to facilities: as more and more tests are given on-line, many schools find their computer labs taken over by testing for weeks on end and not available for learning. Harmful stress: children are pressured to not only demonstrate their knowledge but to represent the effectiveness of their teachers and their schools. Teachers are reporting children throwing up, losing control of their bowels, and increased commitments for psychiatric and anxiety issues. Mandated testing conditions, particularly for some special education students, border on child-abuse and some parents are reporting evidence of self-harming behaviors. Internalized failure: struggling students forced to repeatedly take tests that label them “below basic” begin to believe they are “bad” or “worthless” students who cannot succeed in school. Grades: some high-stakes tests are included in students’ grades. Graduation requirements: as Pennsylvania introduces the Keystone graduation exams, evidence suggests that up to 60% of our students of color will be forced out of school without a diploma on the basis of a single score. Altered school culture: schools must empty their walls and hallways for many weeks; classes are under lock-down with limited access to restrooms; some turn to daily announcements or even pep rallies to “prepare” students for testing and all-school field trips to “celebrate” testing (rather than actual learning). Loss of enrichment: schools are eliminating academic field trips and pressuring teachers not to participate in activities that would take students out of school to maximize classroom time (for test prep). During PSSA testing, Pittsburgh’s gifted center also closes so those teachers can be reassigned to proctor the exams in other district schools. Ideally, teachers are able to use test scores as just one data point among many to determine what students need to support their learning. But the hyper-focus on testing – and accountability measures that hold teachers responsible for getting every student over developmentally-arbitrary thresholds – means that time and again students are not treated as whole, complex learners, but rather reduced to a single score. Evidence also shows serious problems with using high-stakes-testing to evaluate and rate schools. For example, a detailed analysis of the state’s new School Performance Profile (SPP) rating system found that – despite its claim to use “multiple measures” to evaluate schools and teachers – 90% of the calculation is based on high-stakes standardized tests. Yet “these measures are closely associated with student poverty rates and other out- of-school factors.” In other words, the tests are very good at measuring one thing: a family’s socio-economic status. Even the much-touted Pennsylvania Value-Added Assessment System (PVAAS) component of the score, which is supposed to calculate projected student growth while controlling for out-of-school factors, instead strongly correlates with poverty. The report raises “questions about whether the measures are a valid and reliable measure for purposes of school accountability.” In essence, schools are being held accountable, not for what students learn, but for the poverty level of the families they serve. My son’s situation reveals how inappropriate the entire VAM system can be. He is now several years ahead in math and takes his class at the high school each morning, before returning to Colfax for the rest of the day. However, the state would require him to take a PSSA several grade levels below where he is currently working. In what way would this assess his actual learning this year? This test is clearly not about helping my son in any way: it’s about evaluating his teacher. But if he scores at the very top of the PSSA, as he is bound to do, he is simply demonstrating the ceiling effect – there is no way to “show growth” for this student. Yet his teachers are accountable for the “growth” in each student’s test score. Furthermore, which teacher should we hold accountable for his score – the math teacher at Colfax who does not even have him in school this year? His math teacher at the high school who is not teaching him the material covered on the PSSA? Yet as we place more and more emphasis on holding teachers, principals, and entire schools accountable for student test scores, we have seen a plague of adult cheating scandals erupt across the country. We should not be surprised, since Campbell’s Law in social science states that the more a quantitative measurement is used to make decisions, the more subject it becomes to corruption and the more likely it is to corrupt the thing it was supposed to measure. This is exactly what has happened, with the conviction of 11 former teachers in Atlanta this week who are now facing 5-20 years in prison for changing answers on student tests to raise scores. The superintendent of El Paso, Texas is currently in prison for taking low-performing students out of classes in order to increase the district’s test scores. In Ohio several cities apparently listed low-performing students as “withdrawn” to remove their scores from school totals. Some charter schools are well known for the “charter dump,” pushing students out just before testing season in order to inflate their test scores (sending students back into traditional public schools, where their new teachers will be held accountable for their learning). In Washington D.C. former superintendent Michelle Rhee – now the darling of the corporate reform movement who is famous for publicly firing a principal and massive school closures – oversaw her own “Erasure-gate” but was never held accountable. And right here in Pennsylvania our own former state Secretary of Education, Rom Tomalis, was caught both lying and cheating about student test scores (and then went on to occupy a ghost-job in the state capitol, making $140,000 a year but not showing up for work). So why are we doing this? Why are we using our children’s test scores to feed a teacher evaluation system that not only doesn’t work, but actually harms teachers who work with our most vulnerable children? Finally, this Unitarian principle requires a commitment to a responsible search for truth, which means we have to be willing to examine the consequences of our own seeking. What if the collection and use of data on student achievement, as measured by test scores, is actually causing harm? I am exercising my right of conscience by refusing to allow my children to take these tests. Our family cannot and will not be complicit in a system that we see harming others and damaging our common good. High-stakes testing has also interfered with the democratic process. In many cities that lack democratically elected school boards, mayoral appointees have used high-stakes testing to label schools as failures and then moved to close them in unprecedented waves. Chicago is still reeling from the mass closure of 50 schools in 2013, almost entirely in communities of color. In cities like Philadelphia and New York, state or mayoral control has resulted in the privatization of public schools, handing over large numbers to private charter operators. Where is the democratic process when parents and communities no longer have a voice in public education and what is best for their children? When hedge fund managers are pouring enormous amounts of money into local school board races across the country to stack the deck in favor of privatization? When private charter operators are some of the biggest political donors in the state and refuse to comply with Pennsylvania’s sunshine open-records laws? Pennsylvania’s new Keystone exams pose a particular concern for education justice, as they threaten to fail enormous numbers of poor students and students of color, preventing them from graduating (one of the highest stakes of all for students). The Pennsylvania NAACP has demanded the removal of the Keystones as graduation requirements, calling the use of these tests a “present day form of Eugenics.” With pass rates last year at some impoverished schools in the single digits, how will this form of high-stakes-testing create justice for all? And where there is no justice, there is no peace. If we are serious about the goal of education justice, how can we ignore the impact these tests will have on an entire generation of children denied diplomas, with life-long consequences? Where is their liberty and their freedom? To me, this principle evokes Martin Luther King’s famous quote, “Injustice anywhere is a threat to justice everywhere.” We are all connected – in an interdependent web of existence – and the oppression and harm caused to other people’s children, causes harm to all of us. We are all harmed by allowing oppression and oppressive systems to continue. It doesn’t have to be this way. This entire system is only about 15 years in the making. Other countries that we admire greatly for their highly effective education systems do not test like this. If researchers need data to compare we could test sample groups of students, rather than every child. We could test every few years, instead of every year. We could remove the high-stakes for kids and teachers, and go back to using assessments to measure student learning, with the goal of helping students. We could admit that our most vulnerable students – our students living in poverty, our English language learners, our students with special education needs – don’t need more testing, but rather smaller class sizes; a rich, engaging, culturally relevant curriculum; and well supported teachers with adequate resources. In case you missed the Test-In on Saturday, here’s your cheat sheet. We learned so much from the principals and teachers who spoke with us. And from the parents and students who shared their experiences with high-stakes-testing. Even the Post-Gazette attended. [Post-Gazette, 3-22-15] Be sure to study these class notes – there will be a test! 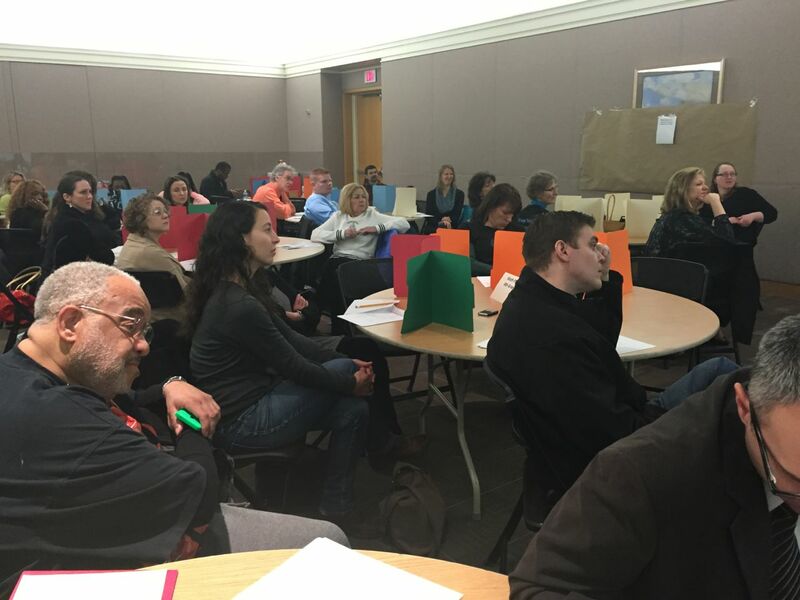 Over 50 people attended the Test-In on Saturday to discuss high-stakes-testing. Parents and students took sample test questions from the PSSA and Keystone exams. Parents tackle the 3rd grade English Language Arts PSSA. 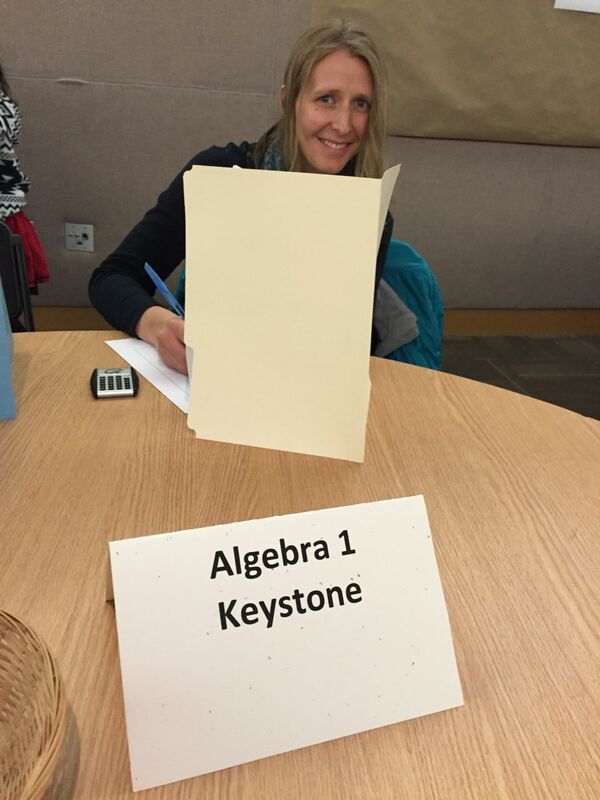 Parents found the Algebra 1 Keystone way too difficult! When one test-taker got sick and “threw up” on her test (OK, this was only a dramatization, but it happens to kids), Yinzercation steering committee member Pam Harbin pulled on rubber gloves and explained that there is a protocol for this: the test must be collected, placed in a plastic bag, and then the answers transferred to another sheet so they can be scored, of course. Ick! Ms. Harbin kindly distributed the test answers at the end of the Test-In, but explained that in real life, students do not get their results back until the following year. In addition, teachers are never allowed to see the tests and neither teachers nor students ever learn what they actually got wrong so they can learn from their mistakes. 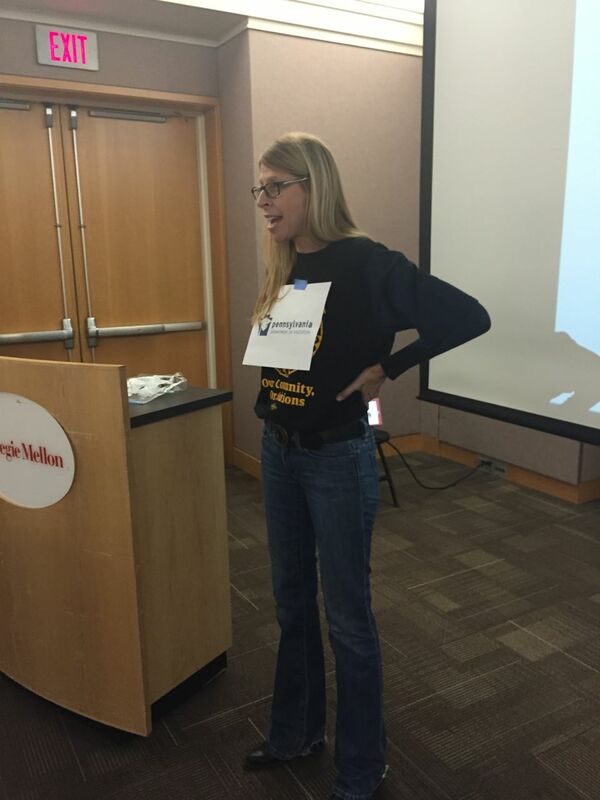 Yinzercation Steering Committee member Pam Harbin as the PA Department of Education explains testing procedures. A “student” gets sick on her test, but it still must be collected and graded! Over testing. He said, “Too many tests are consuming mass amounts of instructional time.” The result is a narrowing of the curriculum, as schools add additional periods in tested subjects and cut back or eliminate non-tested areas such as the arts, social studies, and physical education. Over reliance. High stakes tests have become “the end all, be all for determining if a school is successful or not.” Dr. Taranto has serious concerns about the validity of these tests. For example, the testing company actually uses temp workers to grade the open-ended items on the tests. Another teach pointed out that testing companies advertise on Craig’s List and that graders need only have a bachelor’s degree (not a teaching degree or any teaching experience). Cost. There are huge costs to taxpayers as well as school districts. Dr. Taranto explained that the state is spending $58 million this year just to administer the tests (and that doesn’t include test development or other costs). What’s more, students lose the guidance counselor at his school for over a month because he is the staff member assigned to test administration. Dr. Greg Taranto explains the big concerns he has with high-stakes-testing. Pittsburgh teacher Jon Parker gives heart-wrenching examples of how high-stakes-tests are hurting his students. “So the tragic message from our high stakes test environment is ‘you are your score.’ And if we tell a student he’s below basic regularly from the time he’s in kindergarten, what else would we expect of him? One of the stated goals of No Child Left Behind was to combat the “soft racism of low expectations.” But instead it has created a vicious cycle of self-fulfilling prophecies. “You have failed in the past; you will fail forever.” I cannot imagine where I would be if I had that school experience, but I can guarantee you I wouldn’t be here. “Besides the destructive linking of test failure to personal failure, districts regularly use assessments like Keystones, PSSAs, SRIs, Dibels, and a litany of other acronymed atrocities to exclude students from high quality courses and programs. I have a student this year, one of the most well-rounded and motivated students I’ve ever had, who will be excluded from taking gifted math and science courses next year. Her current averages in both those subject areas are in the high 90s. Her GPA last semester was a 4.0. Teachers universally agree that work ethic is the most important predictor of success in challenging classes. And she would do the work. But instead, though she has the desire, the skill set, the support, she doesn’t have the score. This is bad policy in Pittsburgh, but I can assure you that instances like this happen every day across our state. So we have a young female student of color who wants to take challenging math and science courses. … And high stakes testing is literally the only barrier to her enrollment. “Finally, I’d like to take a massive intellectual leap here and ask you to assume for a second that our tests have some validity in indicating of which students need support so that we can help them. That’s the reason most testing advocates cite. We need consistent data so we can support students who need it. But ultimately what happens in many schools is that administrators and teachers create lists of “bubble students.” These are students who are close to passing the Big Tests. And then teachers work with them individually to help them pass the test. Perfect, right? Yinzercation steering committee member and Steel Valley teacher explains why high-stakes-tests do not provide valid information to teachers and why his daughter won’t be taking them. I’ll admit it – I was scared. I’m a nationally board certified teacher with a masters degree in education. I’ve taught public school for over a dozen years. But I’ve only been a daddy for half that time. Would making this call get my little girl in trouble? I didn’t want to rock the boat. I didn’t want my daughter to suffer because her old man is making a fuss. I didn’t want her teachers and principal giving her a hard time because of something I did. But I couldn’t deny what I know. Standardized testing is destroying public education. It’s stressing kids out by demanding they perform at levels they aren’t developmentally ready to reach. And its using these false measures of proficiency to “prove” how bad public schools are so they can be replaced by for-profit charters that will reduce the quality of kids’ educations to generate profits. No. There was no doubt about it. I had to make this phone call. I used my most professional voice on the line with the principal. Before my little girl started school, I hadn’t even realized there were standardized tests in kindergarten. She takes both the DIBELS and the GRADE test. … When taking the DIBELS, the teacher meets with a student one-on-one while the child reads aloud and is timed with a stopwatch. Some of the words the child is asked to read make sense. Some are just nonsense words. The test is graded by how many words the child pronounces correctly in a given time period. “My concern is that the test doesn’t assess comprehension,” I said. “It rewards someone who reads quickly but not someone who understands what she’s reading. “Moreover, there is a political side to the test since it’s owned by Rupert Murdoch. Cut scores are being artificially raised to make it look like more students are failing and thus our schools aren’t doing a good job. Again, be sure to read Mr. Singer’s entire piece to get the full impact of his powerful message. 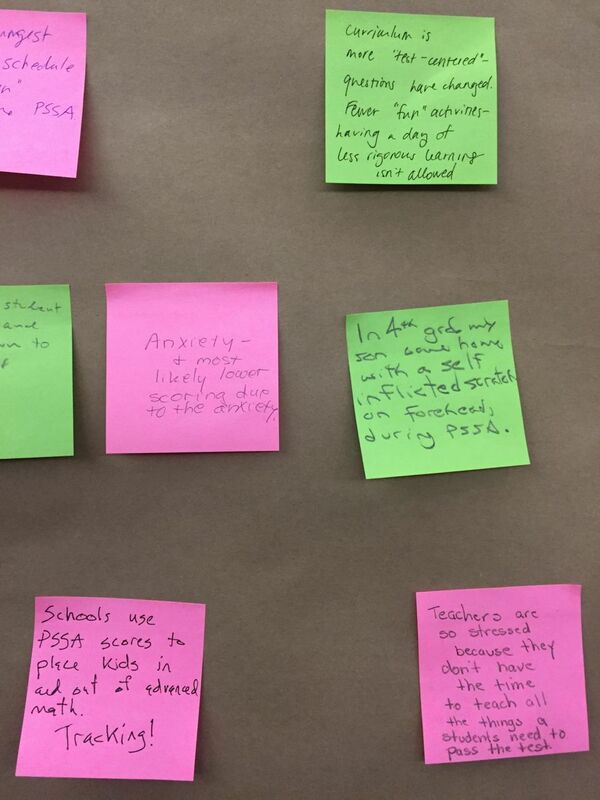 But you get the point: our Test-In presenters all agree that there are major problems with high-stakes-testing. They are being over-used and mis-used. They are not valid measures of student learning. They are costing a fortune at a time when schools are struggling for basic resources. They label students and teachers as failures. They prevent students from accessing programs and opportunities and even prevent students from graduating. They encourage schools to focus on “bubble students” just below the mark, and ignore the most struggling students at the bottom. To this sad list, parents added dozens more examples of the impact of high-stakes-testing that they have seen on students and schools. 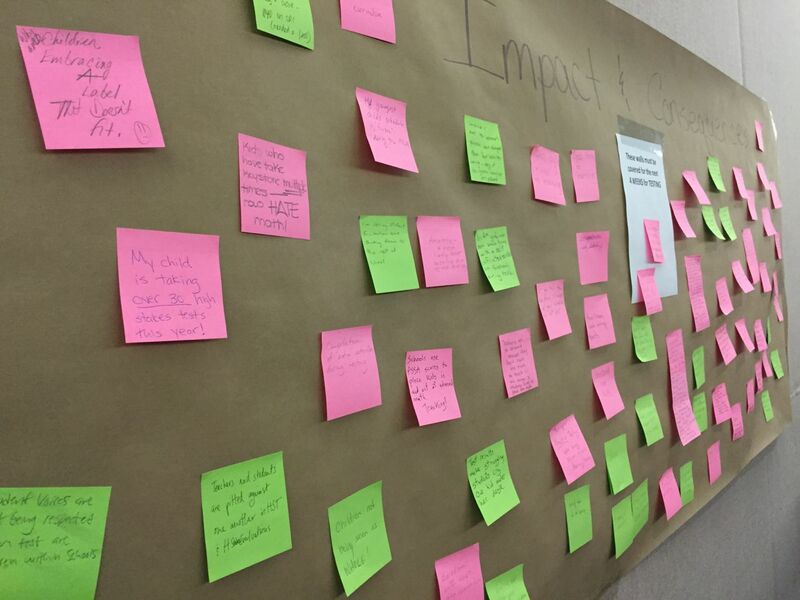 In small group discussions, they recorded these consequences on sticky notes, which we will share in a future post. For now, your assignment is to listen to these educators: re-read this crib sheet and bone up for the test! Get out your bubble sheet and sharpen your pencil. It’s your turn to take the test! Join us this Saturday to see what the PSSA and Keystone exams look like, take sample questions, talk to teachers, and discuss the impact of high-stakes-testing on students and our schools. It’s like an old-fashioned teach-in, only it’s a “Test-In.” Get it? We’ll be learning from some great teachers and educators, including Dr. Greg Taranto. He was Pennsylvania’s 2012 Middle School Principal of the Year and is currently serving on Governor Wolf’s education transition team. Other speakers include Steel Valley teacher (and Yinzercation steering committee member), Steve Singer, and Pittsburgh Allderdice teacher, Jon Parker. Please RSVP on our Facebook event page, and then invite your networks. The Test-In runs from 11:30AM – 1:30PM in the University Center at Carnegie Mellon. Free parking in the garage at Forbes & Beeler. Snacks provided! Co-sponsored by the Great Public Schools (GPS) Pittsburgh coalition and Carnegie Mellon’s Center for the Arts in Society. When students fail the Keystone exams twice in a row, they are required to do a “Project Based Assessment” (PBA). But these projects are equally troubling. The Superintendent of the Bethlehem Area school district explained last week that the PBAs are a “disaster waiting to happen.” He said, “We can’t figure it out yet how we’re going to make this work to the benefit of our students. … We’re really concerned. This is a major, major issue for high schools across the commonwealth.” [LehighValleyLive, 3-10-15] School officials have no way to administer the assessments without having students lose electives or other class time. And no one seems to know how teachers will be able to supervise the completion of all those projects. Where is that time coming from and how many other students will have their learning disrupted as a result? We will talk more about these high-stakes impacts on kids and schools at the Test-In on Saturday. We will also generate strategies together to combat high-stakes-testing. Please come be a part of this critical community conversation. Get those pencils sharpened! 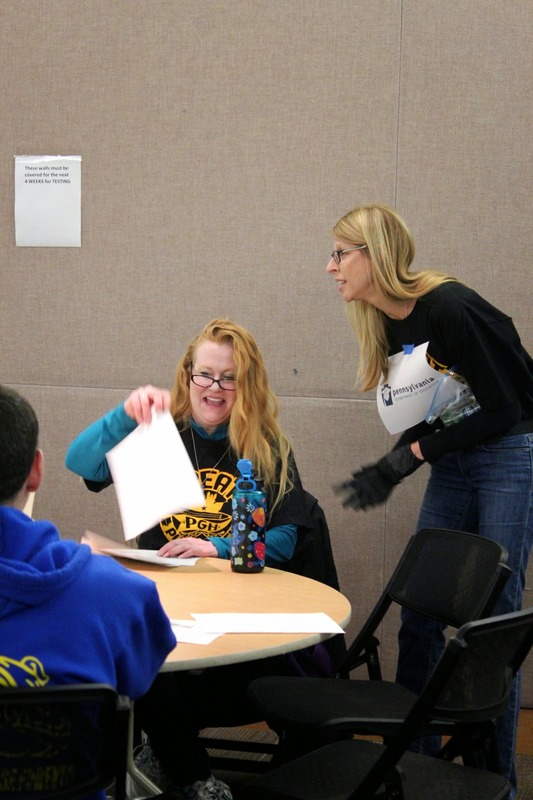 Wednesday, March 18th, 6-8PM at Sci-Tech: The Great Public Schools (GPS) Pittsburgh community meeting will focus on school funding issues, including a session led by Yinzercation steering committee member, Kathy Newman, on the financial impact of high-stakes-testing. Come learn about these un-funded mandates, how they are hurting our schools, what they are costing state tax payers, and discuss what we can do about it. Dinner at 5:30pm and free childcare available. 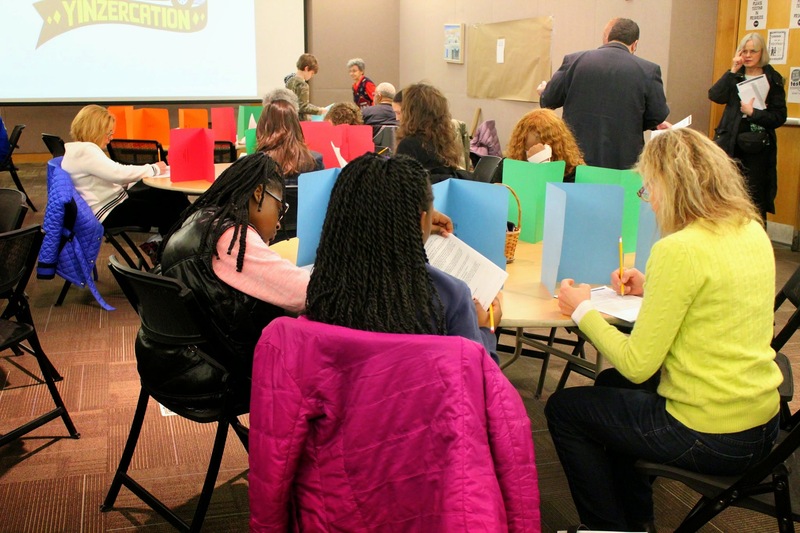 Saturday, March 21st, 11:30AM-1:30PM at Carnegie Mellon, University Center: Yinzercation is hosting a “Test In” for the community to come see the tests our kids are taking and answer sample questions. The event will feature Dr. Greg Taranto (a PA middle school principal of the year and member of Gov. Wolf’s education transition team!) speaking about the impact of high-stakes-testing on students. You might remember his op-ed piece that went viral last year. We will also hear from several teachers, including Yinzercation steering committee member Steve Singer. Keep your eyes peeled for more information. Seriously, you don’t want to miss these opportunities to be a part of the conversation. Now, want to hear what some other folks are saying? OK, so we have local principals, Pennsylvania policy analysts, and national education researchers all pointing to the evidence that high-stakes-testing is not working. What about those most affected: the students? They’re not being quiet either. And it’s not just in New Jersey. Last year, over 60,000 students refused to take similar tests in New York, and the numbers are expected to be even larger this year when students in that state are scheduled to begin testing next month. [New York State Allies for Public Education] In New Mexico last week, thousands of students refused to take the tests and many hundreds protested by walking out of their high schools. [Daily Caller, 3-2-15] Similarly, last fall over 5,000 seniors in Colorado refused new state tests and hundreds participated in mass walk-outs. [Colorado Public Radio, 11-14-14] I could go on and on. “The only remedy left to parents is to refuse to have their children take the tests. Testing is the rock on which the policies that are destroying our local public schools are built. If our politicians do not have the courage to reverse high-stakes testing, then those who care must step in. While test refusal is one of several strategies to combat high-stakes-testing – and we will be talking about those at our events next week – it is clearly growing across the country, and with good reason. I leave you here with the words of New Jersey parents who made this powerful video, and look forward to continuing the conversation on March 18th and March 21st. With support for high-stakes-testing going all the way to the top of both political parties, the White House, and the Department of Education, parents and others concerned about the over-use and mis-use of testing face a continued state by state organizing strategy. Fortunately, they are increasingly aided by brave teachers, principals, and superintendents speaking out about the hazards of high-stakes-testing. Did you catch the fantastic op-ed last week by Superintendent Thomas Ralston of the Avonworth School District, right here outside Pittsburgh? (See below for complete transcript.) That piece went viral from the Post-Gazette web site, where it had 2.3k “likes” on Facebook, and counting! 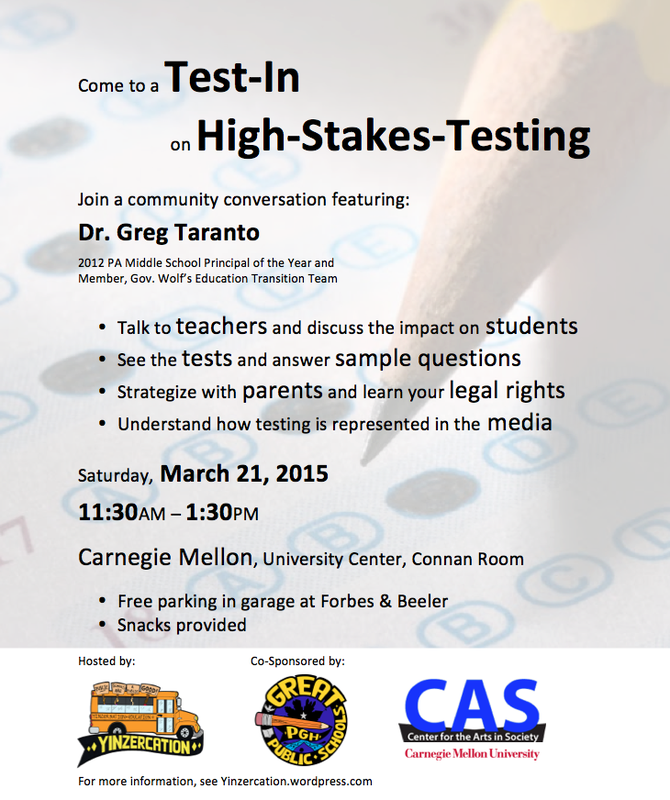 Want to learn more about high-stakes-testing? This Friday, our colleagues at the League of Women Voters are hosting a meeting devoted to the update of the organization’s State Education Policy Position. They will discuss high-stakes-testing and develop a consensus to be submitted to the membership at their PA State Convention in June. The public is welcome to attend and contribute to the discussion (however only League members will be able to vote on the consensus). The Central Pittsburgh Unit will meet at the Squirrel Hill Library, Friday, February 13th at 1 pm. Back in November, I was one of several school superintendents from Western Pennsylvania fortunate enough to be invited to Washington, D.C., along with colleagues from across the United States to participate in the Future Ready Pledge. The day included meetings with President Barack Obama and with officials from the U.S. Department of Education, including secretary Arne Duncan. 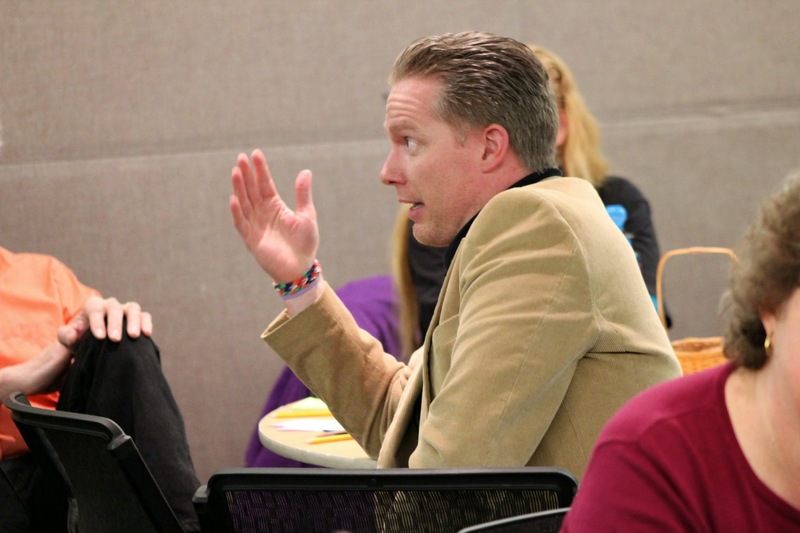 Time for collaboration was also built into the day as the superintendents shared success stories, some from districts in truly desperate situations, and brainstormed about how to meet challenges with creative, innovative solutions. The pinnacle of the day was taking the Future Ready Pledge, led by Mr. Obama, as we dedicated ourselves to employ digital learning tools to prepare students for success in college, career and citizenship. 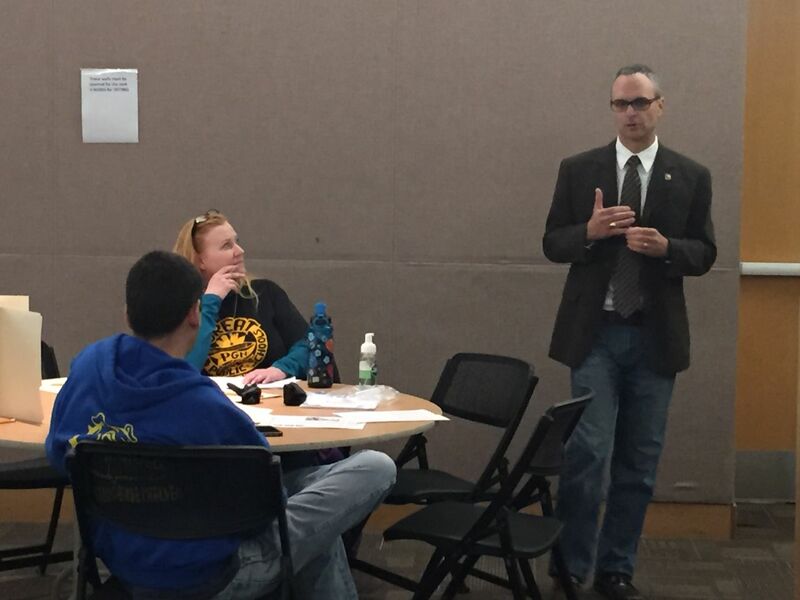 The experience was invigorating and energizing, truly a capstone of my 25 years as an educator. Then, last month, I was disappointed to see Mr. Duncan reaffirm his support for annual standardized testing of all American schoolchildren in grades 3 to 8 and in high school. This announcement runs counter to our pledge to be future-ready. The age of standardized testing has de-emphasized creativity and innovation by overly relying on test performance as a criterion of school and student success. This emphasis has resulted in limiting school curricula, robbing students of experience with the arts and other non-tested subjects. Mr. Duncan has said that “testing issues today are sucking the oxygen out of the room in a lot of schools.” His reaffirmation for the need for continual annual testing contradicts this previous statement. Let me be clear, my colleagues and I embrace assessment. It is essential to inform instruction and allow educators to respond to the needs of their students. However, it should be done daily to appropriately challenge and support each student. 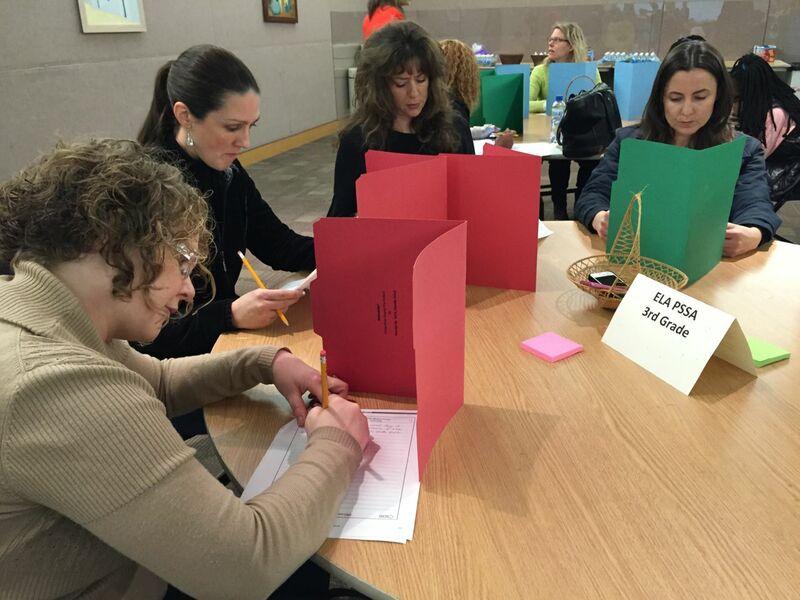 Likewise, broader periodic assessments provide children with multiple ways to demonstrate what they know and can do. Standardized tests do not acknowledge the developmental differences in children. When we endorse them we subscribe to the belief that all children learn the same way and at the same rate. Likewise, standardized tests fail to measure the skills that employers have identified as essential for success now and in the future: communication, collaboration, critical thinking and creativity. In addition, as long as standardized-test performance is used as the primary method of judging the success of schools, it will be the primary educational focus of most schools, especially ones that struggle in our most challenged communities. Alternatives to annual standardized testing of all students to measure school performance do exist. Finland, for example, which has one of the highest-ranked public education systems in the world, randomly selects schools for assessment. The results are confidential, so as not to be punitive in nature. Singapore, another nation universally lauded for its educational performance, invests heavily in professional development and mentoring of novice teachers as a proactive strategy, rather than using standardized tests to shame schools and teachers. Even China, which has traditionally valued standardized tests to determine the future success of its students, is realizing that this approach is folly and is working diligently to reduce the burden of testing and instead focus on learning experiences that accentuate creativity. Every year in the United States, important data on student and school performance is gathered. Students pursuing post-secondary education participate in college entrance exams such as the ACT and SAT. Those who choose vocational fields are assessed with the NOCTI exam once they have concluded their programs. Across the United States, graduation and attendance data are gathered and schools are randomly selected to participate in the National Assessment for Educational Progress. This allows schools to measure and compare academic progress. This assessment, given in grades 4, 8 and 12, provides valuable data on the same subjects that are tested under the federal annual-testing guidelines. With the overdue reauthorization of the Elementary and Secondary Education Act on the horizon, education in America is at a critical crossroads. Rather than continue with an iteration of the act that brought us No Child Left Behind in 2000, I hope it is reauthorized in a way that captures the essence of the Future Ready Pledge. It is time for our government officials to display courage and do what is best for children. The rest of us must make sure our voices are heard as we demand that all children receive creative and engaging learning experiences that will best prepare them for the opportunities of the future. The question remains: Are we working to be future-ready? I am, Secretary Duncan. How about you? Thomas Ralston is superintendent of the Avonworth School District (tralston@avonworth.k12.pa.us).